Raquel Maria Vega Velez Irizarry, age 75, went home to be with her Lord and Savior Jesus Christ on Wednesday, March 27th, 2019 at her home in New Castle, surrounded by her two daughters. 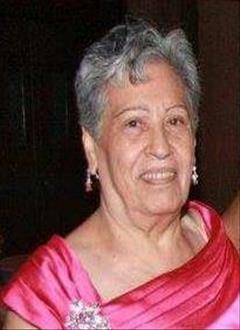 She was born on July 18, 1943 in Sabana Grande, Puerto Rico to Juan Vega and Hipolita Velez who preceded her in death. Raquel attended school in Puerto Rico until the third grade, and then went to work in the coffee fields with her parents to help provide for their family. Upon her parents passing, Raquel took custody of her younger sister, Lydia Marrero (Harry Marrero) and raised her. On October 18, 1960 she married Francisco Irizarry Sr. Together they had three children, Rosa (Luis) Guzman, Francisco Irizarry Jr., and Norma (Raul) Mendoza; five grandchildren: Rosa Ivette Perez, Yolanda (Cyrus) Alexander, Yasinia (Nick) Ortiz, Raul (Jasmin) Mendoza Jr., and Joshua Mendoza, and seven great grand-children, Dejah Perez, Jahki Perez, Elisa Marie Mendoza, Karina Nicole Ortiz, Emma Nicole Mendoza, Nicholas James (NJ) Ortiz, and Joseph Raul (Jojo) Mendoza. She is also survived by several nieces and nephews who she loved dearly. Raquel enjoyed going to Delaware Park to play “ching ching,” traveling to new places, spending time nurturing and caring for her friends and family. She was a true confidant to those who entrusted her and a prayer warrior at heart. She prayed and praised God until the very end. Her love for the Lord resonated in every piece of advice that she gave and every heart that she touched. We would like to give a very special thanks to the team that took care of her at Christiana Care during her hospital stays, Dr. Maria Diaz-Stanchi for being her primary care physician over the past 20 years, Dr. Robin Horn for constantly helping to keep her heart health in line, and the Heart Failure team at Christiana Care for their special attention over the last six months. Word cannot express the gratitude from our family. Family and friends are invited to the funeral services for Raquel which will be held on Monday, April 1st, 2019 at 11:00am at PDH Ministries, 1401 A Street, Wilmington, DE. Visitation will begin at 9:30am until 11:00am. Internment will take place immediately following the services at Silverbrook Cemetery, 3300 Lancaster Pike, Wilmington, DE.